The day dawned... well, it didn't really dawn - it just sort of very gradually became dimly lit. 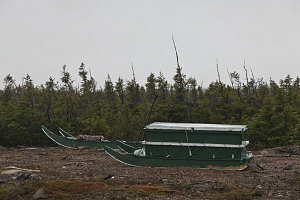 The weather was still wet, windy, and miserable. 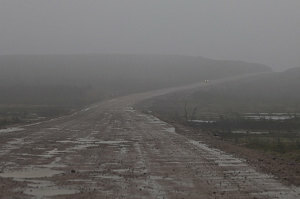 Not the best of conditions for any sort of sight-seeing. Nicely cleaned and tidied up from many days of being outdoors camping and sleeping in the car (remember, the last night under a roof had been way back in Montreal at Francois' place), we headed off. 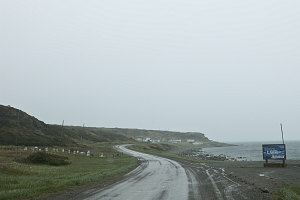 We continued our journey south on Trans-Labrador 510. Again, the road surface along this section is quite potholed and the going is not all that fast. 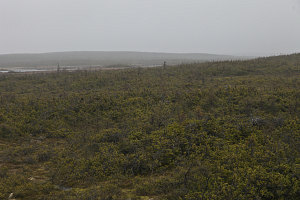 The landscape around us was still quite hilly and with the occasional low mountain, but it was becoming completely devoid of trees, and turning into coastal tundra. 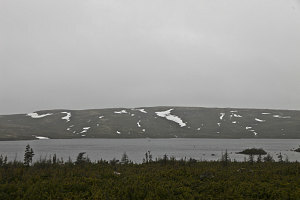 We also started to notice patches of snow on the distant hillsides, then on the very edge of the road itself, especially where it cut through low ridges of bedrock (these are the famous road-cuts that are gaining fame on the internet from pictures showing them being completely snowed-in during Labrador's fierce winters). 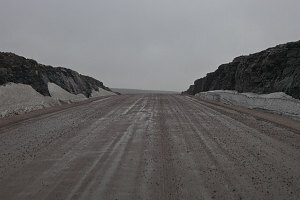 We weren't happy about the weather, but in one sense it fit in - magnifying the barren-ness and inhospitability of this landscape. 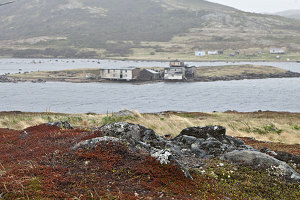 Presently we started downhill towards a community lining the edge of a harbour. 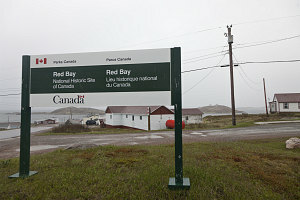 This, we knew, must be Red Bay, and the start of the more developed and civilized section of Labrador's South Coast. Also, this was where the highway turned back to pavement for the rest of its length. 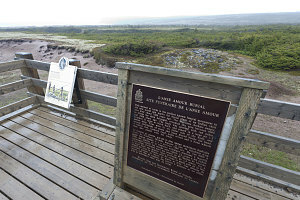 Red Bay is a picturesque little fishing community in its own right, but it also hosts a Parks Canada National Historic Site. 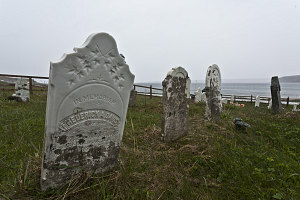 The site preserves the remnants of a 16th century Basque Whaling settlement. The park facilities were closed when we drove by (it was too early), so we moved on. 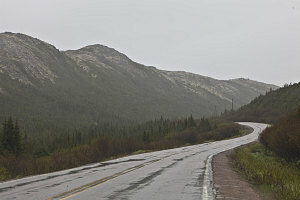 Now with a nicely-paved highway, we made more enjoyable progress southward and westward. 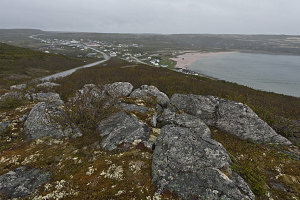 The clouds and rain let up slightly, giving us farther-ranging views of the scenic and rugged coastline. 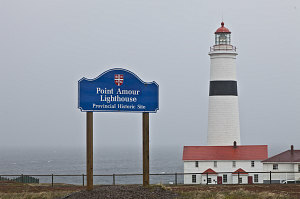 We stopped in several interesting spots along the way, including Pinware Provincial campground (where we had at one point planned to camp) and L'Anse Amour (where there is a very large and historic lighthouse complex and a very old prehistoric indian burial site, among other things). 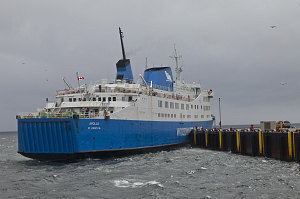 The ferry that crosses from Labrador to Newfoundland doesn't actually leave from Labrador. 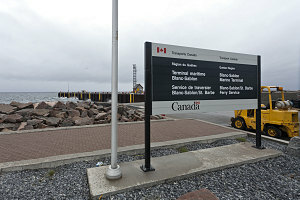 That's because the ferry port on the mainland is actually located in Quebec, in the easternmost sliver of the province, in a small town called Blanc Sablon. 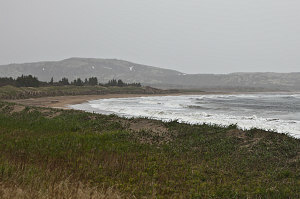 Blanc Sablon is just minutes from the point at which the Trans-Labrador reaches its 'eastern' terminus, at the border with Quebec. 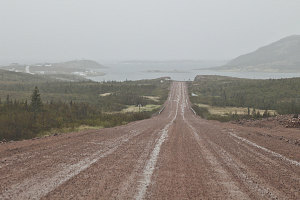 With the crossing into Quebec, we had completed virtually all of the Trans-Labrador highway, save for some minor side branches. 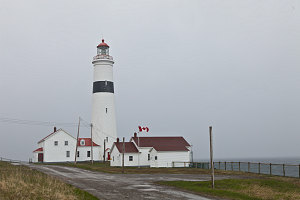 We weren't hurrying particularly fast along our coastal drive; this was because there were only two ferry crossings per day across the Strait of Belle Isle to Newfoundland, and we thought we had clearly missed the early morning sailing, and so were aiming for the afternoon sailing. 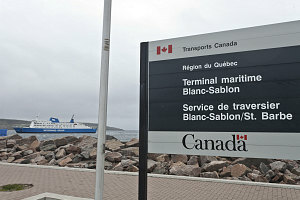 However, as we approached the Blanc Sablon terminal, we noticed a long line of cars - even though it was only 9:30 a.m. Could it be that the strong winds and inclement weather had delayed the early morning ferry? 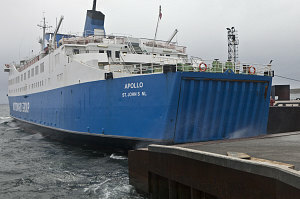 As it turned out, that was exactly what had happened - the morning departure had been delayed until 11:00am. This was quite a good stroke of luck for us, as it allowed us to make up some of the lost time due to not making as much distance as we had wanted the day before. I got into line for last-minute tickets (it is preferable to book a few days in advance), but fortunately there were still spots left after all the reservations had been processed. With our tickets in hand, we waited around in the little convenience store near the terminal, where we met a couple of hardy motorcycle travellers. 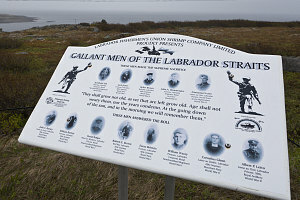 They had just come the way we had -- over the long and sometimes rough Trans-Labrador highway -- except they had done it on a BMW R100 motorcycle. 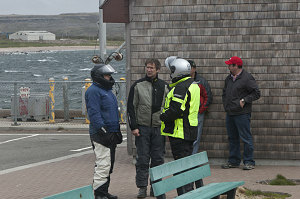 We introduced ourselves and chatted a bit. 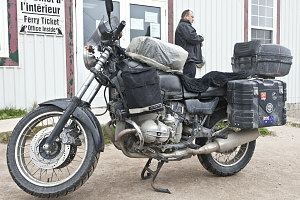 They were Brian and Jenny (not positive on the spelling of either name), from Australia, and were on a round-the-world motorcycle tour. Impressive. 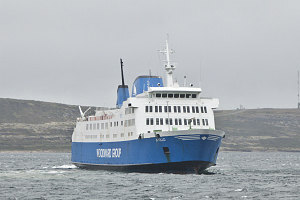 The time of the ferry's arrival was approaching, and I went outside into the very windy (but fortunately no longer rainy) weather to capture its approach. 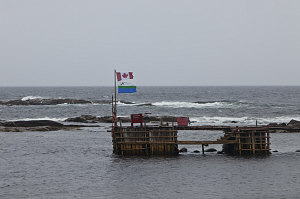 I was able to watch the skill of the ferry's captain as he negotiated the large craft into the dock under such adverse conditions. 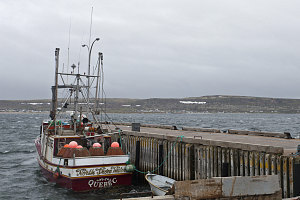 The heavy winds necessitated a sort of 'pinning' maneuver, where the ferry was carefully slid backwards while directly touching the end of the dock until it could be swung around, still pressing against the dock under the force of the north-east wind, and slid into place. After what seemed an eternity, we were finally signalled to load our vehicles into the back of our ferry (which, incidentally, was named the MV Apollo). Once safely parked inside, we made our way to the upper decks, where a 1970s-ish vintage of furnishings greeted us. It was fairly large and comfortable, though, and we took up a spot next to the small on-board restaurant and ordered some lunch.